Wood thinks so. His agent, GotoGate, says so. But it’s been 13 weeks since the online agency promised a refund — and he’s still waiting. Wood’s case is weird. He asked for a refund for something my advocates and I would normally advise you to just accept — a 15-minute schedule change. Remarkably, even though he probably wasn’t entitled to a refund from GotoGate after the schedule change, the company sent him a promise for it in writing. So do we hold GotoGate to a promise it shouldn’t have made? Wood, a teacher who works in Kikugawa, Japan, had booked a flight back to the U.S. in October through GotoGate. Japan Airlines then made a small schedule change, prompting him to contact the online agency. “I was assured by two employees that I will get 100 percent refund minus credit card fee in two to eight weeks,” he recalls. But 13 weeks later, unsurprisingly, there was no refund. Wood has also called Japan Airlines several times to ask about his refund. “They have told me that they didn’t take the money from GotoGate,” he says. In other words, the online agency still has his money 13 weeks later. In the United States, to qualify for a refund because of a schedule change, the change must be significant. And a refund isn’t automatic. Take United Airlines, which outlines its rules in its contract of carriage. A change of less than half an hour doesn’t even warrant a mention. Anything over half an hour still isn’t guaranteed a refund. If the Passenger is not transported as provided in C) 1) or 2) above and does not choose to apply the value of his or her Ticket toward future travel as provided in C) 3) above, the Passenger will be eligible for a refund upon request. Phew. That’s a lot of rules. Why did GotoGate promise a refund for this small schedule change? Japan Airlines doesn’t address a schedule change like Wood’s in its international conditions of carriage or in the refunds section on its website. If there is a rule at Japan Airlines, it is probably an unpublished policy. Bottom line: When a schedule changes, airlines do offer refunds on a case-by-case basis. It’s always best to ask the airline directly if you qualify. Your travel agent should know, too. 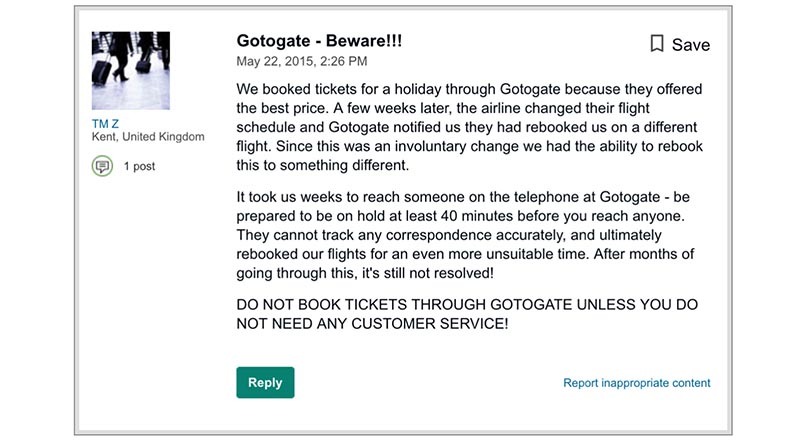 Interestingly, GotoGate didn’t just promise Wood a full refund by phone. It also did so in writing. Your flight with the booking number WKU6QU is now cancelled due to the time change that has happened. The money will be refunded to your credit card. Please note that the service package and any credit card fee will not be refunded. We are handling all refund matters in turn and in present time the handling time is around 2-8 weeks. So that left my advocacy team with a dilemma. We know that it’s unlikely that Japan Airlines would authorize a refund for a 15-minute schedule change. Yet Wood’s agent assured him that he would, indeed, get his money back. Now it appeared GotoGate wasn’t doing what it shouldn’t have promised. Do we hold them to it? GotoGate is a European online agency owned by Scanworld Travelpartner AB, which is owned by Etraveli AB. It claims to fill the equivalent of 140 Boeing 737s every day, and while that may be true, it also fills the internet with complaints. It has its own Facebook hate-page and more than a few posts from unhappy customers. I’d like to give GotoGate the benefit of the doubt. If these complaints are just outliers, then it will try to make this right for Wood — even if it’s a mistake. Our advocate, Dwayne Coward, contacted GotoGate on Wood’s behalf. In response, a company representative said it “regrets the problems” Wood experienced. Looking at the reservation, the customer was in contact with us the 23rd of October to cancel their booking due to a schedule change of 15 minutes. As the change was quite small, we needed to contact the airline to have them to authorize the refund. The airline informed us the 25th of October that we had to apply for refund to the airline, which can take up to 16 weeks before it’s authorized. Unfortunately, the customer was misinformed by our agent, that the refund would be processed within 2-8 weeks. The airline hasn’t approved the refund yet, but as we have incorrectly informed the passenger of the refund time frame, we have decided to refund the passengers from our side today and then await the refund to be authorized by the airline. A refund of 247,024 yen (about $2,243) has been processed to the original form of payment and will be available on the account within 3-5 bank days. Wait, did GotoGate just say it takes 16 weeks to authorize a refund? That’s ridiculous. It’s nice of the online agency to take responsibility for its mistake. But really, Wood shouldn’t have ever asked for a refund for a 15-minute schedule change in the first place. And GotoGate never should have offered him one. Should Wood have been promised a refund for a 15-minute schedule change? Posted in Help Tagged CAN YOU GET A REFUND FOR A 15 MINUTE SCHEDULE CHANGE?, DOES A SHORT SCHEDULE CHANGE QUALIFY FOR REFUND?, GOTOGATE PROMISED A REFUND BUT NEVER SENT IT, WHY DID GOTOGATE PROMISE A REFUND FOR THIS SHORT SCHEDULE CHANGE?